There is nothing more to say with this guy. 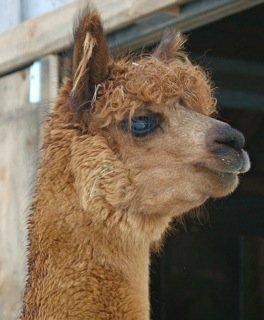 If you are looking for a very kind and gentle pet or a fabulous fleece animal or both then he is the one for you! Look at his terrific lineage to understand why. Shearing Date: April 20 2007. Shearing Date: April 19 2008. Altiplano Gold has produced a New England staple bloodline. His offspring are highly sought after. His reputation for consistently producing high levels of quality in his offspring is unmatched by most males. 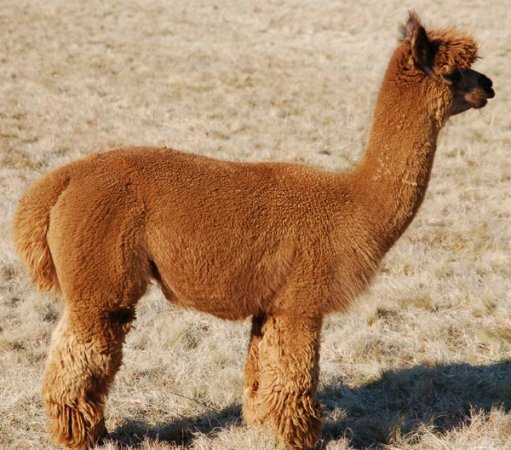 He has an amazing ability to pass on positive traits in fleece and conformation--with over 90% of his offspring (or those with his lineage) placing first and second in tough local and national competitions. 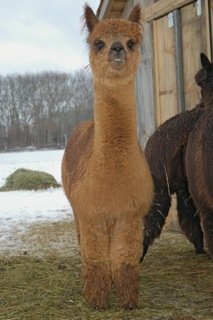 His cria have shown instant improvement over their dams. 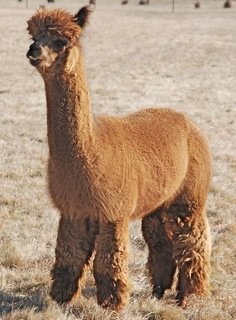 Even dams of the highest quality have crias that are a step up with Altiplano Gold as their mate--all the right positives to the right degree to produce the complete quality offspring. From density coverage architecture and crimp--fleeces are taken to the next level. Body types are improved with heavier bone and greater "type" in style.